Stockholm, Sweden. 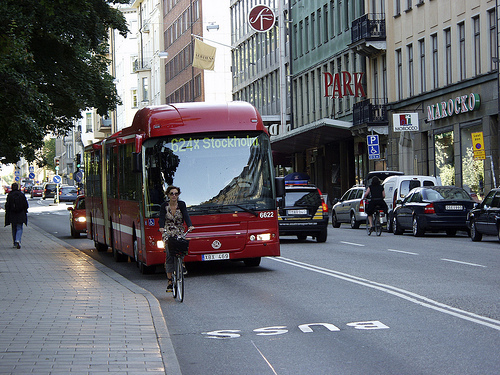 Photo by Storstockholms Lokaltrafik. The Swedish Trade Council and the Embassy of Sweden hosted a seminar on sustainable transportation last week at the House of Sweden in Washington, D.C., as part of their fall program, “Shaping Tomorrow’s World – Infrastructure & Intelligent Mobility.” With speakers from both Sweden and the U.S., the seminar highlighted best practices in sustainable transportation and debated solutions for the future. The first half of the afternoon was devoted to discussing alternative fuels and sustainability initiatives in the transportation sector. The second half, which we recap here, focused on cities and infrastructure. Clayton Lane, acting director and chief operating officer of EMBARQ (the producer of this blog), and Robert Puentes, senior fellow of the Metropolitan Policy Program at the Brookings Institution, both emphasized the growing importance of cities as centers of population, and increasingly, innovation. Lane walked through numerous examples of sustainable urban transport solutions. Drawing on his experience as one of the founders of PhillyCarShare, he discussed how car sharing initiatives like ZipCar provide economic incentives for people to drive less and save money, while still allowing them to access a car when needed. Similarly, bike sharing systems, which are growing in popularity in cities around the world, help convert non-believers into urban cyclists. An amazing statistic from the city of Lyon, France shows that 96 percent of those who used its bikeshare system Vélo’v were first-time city bikers. Developing countries are often at the forefront of sustainable transport innovations, and there are excellent opportunities for South-to-North technology transfer. Bus rapid transit (BRT) systems, such as those in Istanbul, Turkey or Bogotá, Colombia, provide low-cost, effective mobility. Istanbul’s Metrobüs is projected to carry 800,000 passengers per day, as much as the entire Washington, D.C. Metro system. Finally, Lane stressed the importance of land use planning, citing the example of the Mexican housing financing authority INFONAVIT’s support for a redesign of the new community of Aguascalientes to promote mixed-use development with lots of space for biking and walking. Lane concluded by pointing out that these varied solutions are easy to scale, replicate, and adapt to local conditions, and they require policies that are about moving people, not cars. Moving the conversation to the U.S., Puentes said that “sustainable transport needs to be looked at through the lens of restoring the economy.” In his view, metropolitan areas align the inputs that matter most: infrastructure, innovation, human capital and sustainability. Puentes called for federal and state governments to “lead where they must” and encouraged metros to “innovate where they should.” Other specific measures he suggested for reforming the transportation sector in the U.S. included setting a price for carbon, modernizing a tax code that is tilted towards real estate and consumption, setting up an infrastructure bank, and rethinking the way transportation policy is set in Congress. When asked whether the public sector, private sector or civil society would play the largest role in creating a low-carbon economy, the panelists agreed that all three will have to work together but the government would play a special role in building required infrastructure. Friberg gave the example of Germany, where there are more jobs in the green energy sector than in the automobile sector, due to the German government’s “political courage” in passing progressive energy policies. A number of the panelists noted that advanced vehicle technologies already existed, with Friberg pointing out that “the future is already here, it’s just unevenly distributed.” However, they disagreed about whether the technology was ready for wide-scale deployment, with some saying that land use and behavior change were the most important priorities at the moment. Moving beyond the status quo is difficult, however, due to entrenched financial interests in continuing the current model, and because the financial, environmental and transportation sectors are not used to working together. There is some hope, however. Both Fredrik and Mollet emphasized the role of non-traditional partnerships in tackling some of these barriers, such as recent initiatives by city mayors to learn from their counterparts’ experiences in solving big-city challenges. Mollet was also encouraged by the fact that voters seem to be willing to pay to receive services they need, pointing to the slew of successful tax-for-transport referendums in the U.S. In the end, pursuing sustainable transport solutions saves money, a powerful argument for progress in this time of economic recovery. Green Intelligence Live Blogging: "Innovations in Global Transport"
Green Intelligence Live Blogging: "Moving Towards Clean Transportation"